NETWORK FINALS: THE MIDDLE gained 0.1 in final numbers, while THE MAYOR lost the same. CABLE HIGHLIGHTS: Last Tuesday night was both Halloween and World Series Game 6, so the trend was generally up. ESPN’s 30 FOR 30 documentary about Ric Flair took the night at 0.91. FX’s AMERICAN HORROR STORY: CULT rose 0.11 to 0.83. 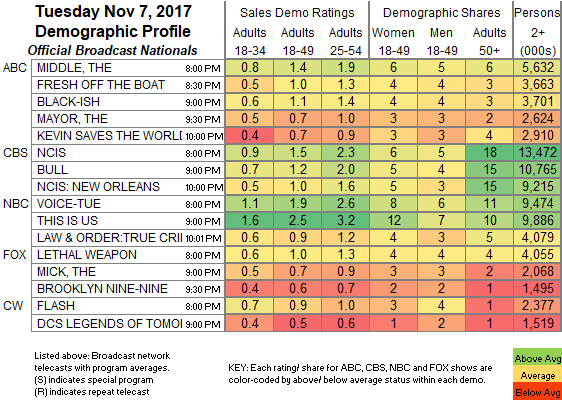 On USA, WWE SMACKDOWN gained 0.17 to 0.82, and served as the lead-in to the premiere of DAMNATION, which didn’t hold the audience very well at 0.28. (By comparison, the series premiere of SHOOTER, airing in the same post-SMACKDOWN timeslot, was at 0.50.) THE CURSE OF OAK ISLAND returned to History at 0.78, with a lead-in special at 0.46. 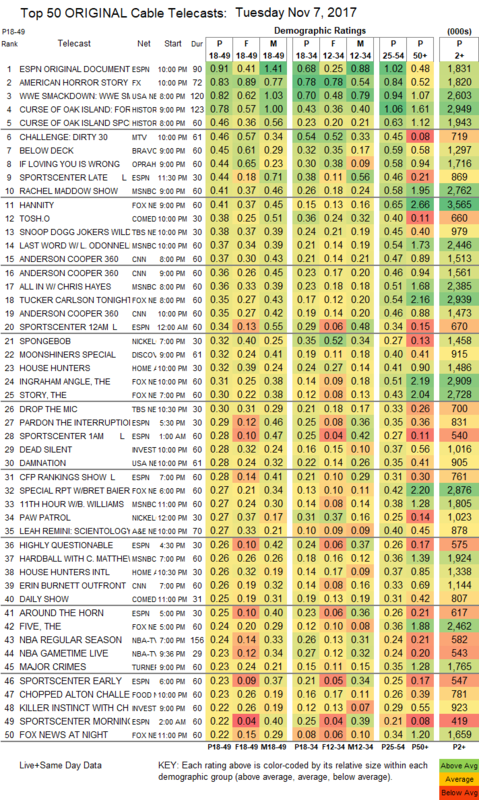 MTV’s THE CHALLENGE edged up 0.03 to 0.46. Bravo’s BELOW DECK ticked up to 0.45. OWN’s IF LOVING YOU IS WRONG returned at 0.44. Election night cable news was neck-and-ncck in the younger demo for MSNBC’s RACHEL MADDOW SHOW (0.41/0.58/2.8M) and Fox News’s HANNITY (0.41/0.65/3.6M), with CNN’s ANDERSON COOPER 360 close behind at 0.36/0.46/1.6M. On Comedy Central, TOSH.0 jumped 0.13 to 0.38, and THE JIM JEFFERIES SHOW was up 0.08 to 0.21. On TBS, JOKER’S WILD climbed 0.03 to 0.38, and DROP THE MIC was steady at 0.30. Discovery aired a MOONSHINERS special at 0.32. On HGTV, HOUSE HUNTERS was at 0.32, and HOUSE HUNTERS INTL was at 0.26. ID’s DEAD SILENT grew by 0.08 to 0.28, and KILLER INSTINCT was up 0.05 to 0.22. A&E’s LEAH REMINI: SCIENTOLOGY & THE AFTERMATH slid 0.03 to 0.27. TNT’s MAJOR CRIMES gained 0.02 to 0.23. On Food Network, CHOPPED held at 0.23. On TLC, THE LITTLE COUPLE ticked up to 0.22, and HODGES HALF-DOZEN debuted at 0.19. NatGeo’s miniseries THE LONG ROAD HOME premiered at 0.21. BET’s THE MANE EVENT remained at 0.20. On Tru, ADAM RUINS EVERYTHING ticked up to 0.18, and AT HOME WITH AMY SEDARIS was steady at 0.09. Spike’s INK MASTERS: ANGELS was up 0.02 to 0.15. TV Land’s TEACHERS returned at 0.11. The 2nd half of HBO’s ROLLING STONE documentary was at 0.08.